Around two years ago, it seemed like the website and quasi-social platform DriveTribe could be the next big thing for gearheads everywhere. Launched with the financial and promotional support of Grand Tour hosts Jeremy Clarkson, James May and Richard Hammond, it promised a fresh new home for user-created stories as well as editorial content. But two years in, it’s apparently mostly been burning through cash like a Zenvo ST1. Multiple outlets in the UK report that, based on financial reports filed recently, DriveTribe has lost £12.5m in its first two years—about $16 million at the current exchange rates. Papers filed at Companies House blamed losses on ‘administrative costs’ mostly. DriveTribe has the backing of several high profile investors including 21st Century Fox. A director’s report from the company stated that they were expecting research and development tax credits and forecasts ‘assumed’ that revenues would grow steadily throughout 2018 and 2019. Which is amazing, especially considering the three former Top Gear hosts have all invested in the venture, that it raised $5.5 million in Series A funding in fall 2016 and that it got $6.5 million from 21st Century Fox around the same time. Those are some pretty extreme expenses for what amounts to a relatively small staff! We reached out to DriveTribe for comment and will update this story if we hear back. The site was co-founded by Clarkson, Hammond and May, as well as former Top Gear producer Andy Wilman and tech entrepreneur Ernesto Schmitt, who served as CEO until he left six months after its founding. The site is not owned by Amazon and remains a separate interest from The Grand Tour. 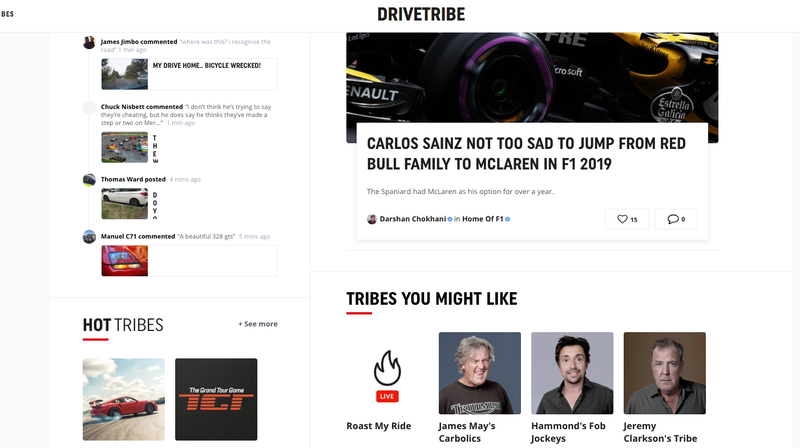 DriveTribe allows users to form “tribes” around common interests like certain types of cars or racing series, and Clarkson, Hammond and May all have their own that get regularly posted to, although it’s unclear if it’s actually them doing so. Like a lot of new social platforms, it garnered a lot of interest and users early on, but few of them seemed to stick around past a few months. Early on, navigating the site and finding tribes and content proved exceedingly difficult. How many active users it has is also unclear. The site’s monthly traffic is so minimal that it hasn’t appeared on analytics tracking website ComScore at all in 2018, and the few months it was there in 2017, it was under 100,000 U.S. unique visitors each month. (For context, Jalopnik got around 11 million U.S. unique visitors in July alone, as rated by ComScore.) DriveTribe does have nearly four million Facebook fans, although its Twitter presence is much smaller at 86,000 followers. Part of the issue with DriveTribe stems from a central problem—what exactly are you supposed to be doing there? If it’s sharing your own posts and pictures and videos, you can do that on any number of larger, existing platforms like YouTube or Facebook; if you’re there to read automotive news and feature stories, then DriveTribe was competing with every other media outlet in the car space. On the editorial side DriveTribe hired some big-name UK journalists to create written content and video reviews like Harry Catchpole, Jethro Bovingdon and Lewis Kingston, but none of them are there anymore. These days the site is a mix of some seemingly original editorial content, user content and perplexing, seemingly unmarked sponsored content; does anyone really believe professional race car driver Mark Webber is on DriveTribe, personally posting about Porsche’s sales figures in China? Or is it far more likely that’s all being done in his name by a PR firm? As a side note, yours truly submitted his own tribe on the network ahead of the official launch, but the tribe in question didn’t go anywhere at all. The underwhelming experience is mirrored by other people who tried to get involved in the project, with the notable exception of all-stars such as the three presenters, Shmee 150, Salomondrin, and so forth. In other news, what started out as a community for every car lover among us became a sort of monopoly for the rich and famous. Anyway, it’s all kind of a shame. With the right backing and management, DriveTribe could have been a great platform for car enthusiasts everywhere. As it stands now it’s yet another depressing example of how hard it is to launch a new publication and a new platform in 2018, but even that doesn’t account for the massive financial losses reported here.